This has been a good week for reflection and planning. We’ve gotten out the new calendars, are noticing the growing light, and we’ve been driven inside by storms and bitter cold! First, a look back to consider accomplishments on the homestead in 2017. I tend to push forward and move on to what’s next, but I know it’s good for me to take time to learn from successes and problems we had, and to allow for a sense of satisfaction and gratitude for what worked. I will make better, smarter plans coming from this place. One of my bean plants produced this seed. I have no idea what it is – anyone know? In the plant realm: we expanded our growing areas using swales, sheet mulching and hugelkultur. We planted 5 new trees, 10 new berry bushes, many new perennials, and a big garden of annuals. I tried some new crops: various heritage dried beans, a heritage variety popcorn, and 3 new types of potatoes. My records show that the Bora Valley and Nicola potatoes were my biggest producers this year. Yay for record keeping! We had very few insect pest problems this year, other than some early squash vine borers. I had almost no colorado potato beetles, and the cabbage worms didn’t become an issue until much later in the season than usual. I planted both of those crops late this year possibly missing the first reproductive cycle for the pests. That was purposeful for the beetles, but accidental for the cabbage worms. fall’s breeding failure meant less of it. I built my apiary back up after a lot of winter hive losses. I did have one hive that overwintered well and had an amazing season. Steve built a new shelter for hay and animals which I anticipate will help us get much more organized thus saving us quite a bit of work in the future. 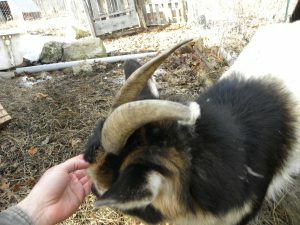 This year I also taught classes in beekeeping, soil building, animal care and permaculture. I accepted the 2017 NOFA-NH Gardener of the Year Award. I wrote new blog posts to share here on our website. Successful Bee Hive – Hope to Have More Like These in 2018! In the new year, I look forward to more plants and animals and continued good work with the earth. Our seed, potato and tree catalogues are spread out to choose next season’s varieties. We did save more of our own seed this year, but not for all crops. We’ve identified where we want to expand to next and even got that started in the long, warm fall we had. I have learned not to order trees or bushes for the areas we didn’t finish yet! We have some unhappy plants overgrowing their nursery beds from the years I was too optimistic about how fast the work would go. For my blogging this year, I am going to try something new. Often I am asked: “what do you do at your farm?” and “how much do you grow?” I never have great answers. Each season and every day is so different, in terms of what we do and what we harvest. 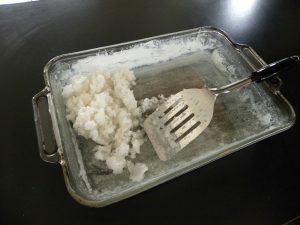 In 2018 I am going to try to give a monthly update, summarizing what we did and what we harvested in the previous month. It won’t be a quick answer to those questions, but it should be informative. I hope you’ll follow us and join me in charting the next year as we experience it! (of a bird) sit on (eggs) to hatch them. I have been brooding (“pondering” but not really moodily!) 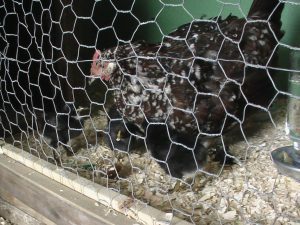 on brooding (“sitting upon eggs to be hatched”) this spring since it has been our poultry’s most broody year yet! When we first started chickening in 2008, we loved the idea of letting them raise their own next generations. It seemed more natural and more energy efficient, both electricity and human energy-wise. 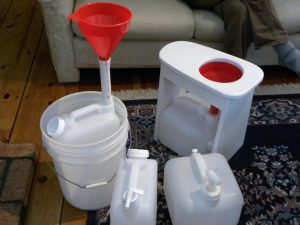 Also, we had misgivings about some of the big hatchery practices and wanted to move away from that model [note: I tried to find an article for you that would give some details on hatchery practices in a way I thought was fair and reasonable and didn’t demonize chicken-keeping in general, but haven’t found one yet. Here is a good discussion of some of the issues. The one exception I know of and do recommend, because it isn’t truly a big hatchery although it is mail-order, is Sand Hill Preservation Center]. 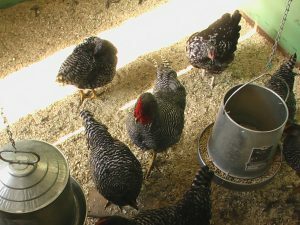 Our first flock was a mix of Dominique and Speckled Sussex chickens, which we did as a joint project with our good friends, Steve and Rhoda. At the time they had land, which we did not, and we were available to help chicken-sit when they traveled, which they needed. So, it was a great collaboration! We started with straight-run, which means you get whatever gender you get. Again, this seemed most natural to us. We would later eat all the males but one, who would take over as the protector of the hens and fertilizer of the eggs thus making it possible for the flock to raise more birds from their own eggs. Both of these breeds were considered sometimes broody so we thought we had a chance. For a couple of years we did have a Speckled Sussex go broody. We called her “Broody,” I’m a bit embarrassed to say! We didn’t take great notes back then, but the first year she raised 3 or 4 and the next year was about the same. Some were males, of course, so we ended up with a few new hens this way. This was clearly not going to be enough to keep the numbers up in the flock as we planned on a turnover of 2-3 years for the hens. 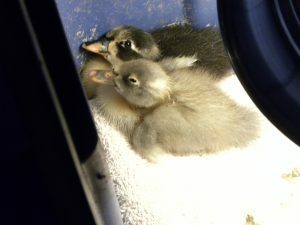 Research gave us ideas for how to encourage brooding and how to get more chicks out of each hatch. Leaving eggs was the main advice in terms of getting them to sit. Then being sure the eggs all started incubating under her at the same time would help with getting more to hatch. If the eggs hatch over too long a time period she will have to abandon the unhatched ones to take care of the new chicks. We still weren’t having much success. We had a few hens start to brood, but not see it through. We went back to ordering chicks to keep our numbers up. Around 2012 we had a really bad experience with a lot of sickly chicks. Most had been shipped to us, but a few were from a local store. For weeks, every few days there would be another dead chick, and we learned about all sorts of nasty chicken diseases. It was so depressing and pushed us to take the plunge and – buy an incubator! We’d had it with shipped chicks from questionable conditions and wanted to start getting more serious about breeding our own, for ourselves and hopefully offering some for sale so others could also get more local with their stock. If the hens wouldn’t cooperate and do it for us, then an incubator would do the job! 2014 was the first incubator year. We did two rounds. On June 15th 12 out of 18 eggs hatched and 4 months later we had 12 healthy birds. On July 12th 17 out of 39 eggs hatched and 4 months later we had 15 healthy birds. We were much happier with this experience! They really seemed so much stronger and happier having not endured the stress of 1-2 days in the mail. 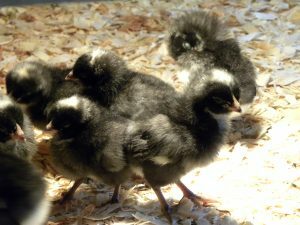 In 2015 we did two more incubator chicken hatches. We again had good results, with the earlier hatch being the most successful – June 5: 33 out of 43 hatched; July 6: 21 out of 48 hatched. Egg fertility went down for the later batches. 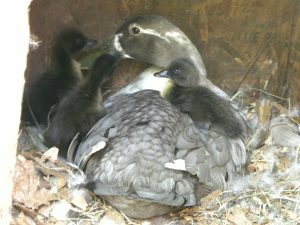 We also tried duck eggs since we’d been keeping Indian Runner ducks for a few years and they are notoriously unbroody. The ducks were way less successful, but we did end up with 5 (out of 21 eggs, though) ducklings, better than nothing. 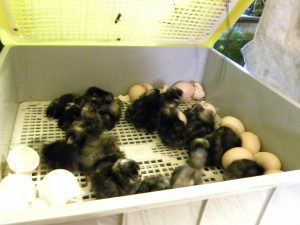 This year, 2016, we went with one early hatch, setting 48 chicken eggs on April 16 which led to 30 chicks in the brooder by May 8! However, as we are getting more adept at incubating, our chickens are suddenly taking an interest in doing it themselves after all. In spring 2015, we had 2 hens get that broody look – lots of time in the nest boxes with a trance-like look in their eyes. 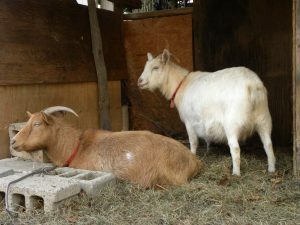 We tried to move both of them to their own areas, but that made both of them get up, shake themselves off, and tell us “never mind.” Not long after that, however, a chicken went missing. I searched their yards, the nearby woods – no sign. I figured, oh well, some other critter ate well that day, our contribution to the wild. But 21 days later – peep, peep, peep! 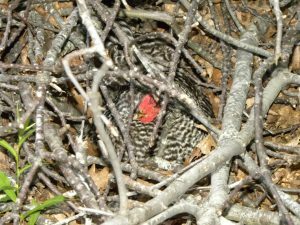 She had made herself a great nest in a pile of brush in the middle of their largest yard where no one – not me or any predators – found her, giving her the time to hatch out 8 babes. 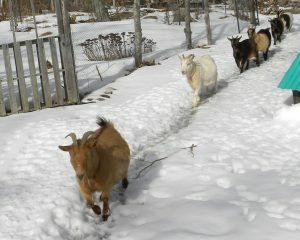 We scooped them all up and moved them to one of our chicken tractors so she could raise them with a bit more safety. Wow, she was skinny when we caught her! We’d hoped this would be a trend, and it seems so – this spring gave us 4 broody hens out of our flock of 11 chickens. Each one we moved into their own smaller coop to brood in peace. One of them changed her mind when moved, but the other three stuck with it. The first hatched out 6. The second only hatched 3 – but this coincided with the incubator hatch so we gave her 3 more chicks to raise for us, which she happily adopted. The third hasn’t finished her 21 days yet, so we’ll see. Still not enough to give up the incubator, but maybe we’ll get there yet! So, here’s where MY brooding comes in: What are we doing differently that is finally giving us all these broody hens? The two differences I can note are changes I made because we had an egg-pecker this past winter. At least one of the hens was pecking eggs, and I didn’t want to encourage that or let her/them get into eating their own eggs. So, I bought a dozen ceramic eggs and I put up nest box curtains. The ceramic eggs are supposed to be frustrating and maybe a bit painful for them to peck at, and the curtains keep the eggs less visible and thus less of a temptation. Also, our chickens definitely preferred the farthest, darkest nest box, and we hoped the curtains would get them to spread out to the others and maybe they’d encounter fewer of each others eggs. My theory is that having the constant presence of an egg or two in the boxes, and having the boxes darker, thus seeming safer and more private, gave them the push to brood. One other factor is that we did get a new rooster from a more local source through the NH Poultry Fanciers back in 2013. It could be that he brought in a line that is more inclined to broodiness. 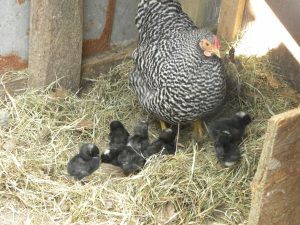 Two people who bought chicks from us last year also had broody hens this spring, so this could definitely be a factor. 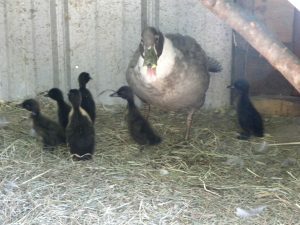 As a very unexpected bonus, our oldest Indian Runner duck also went broody! 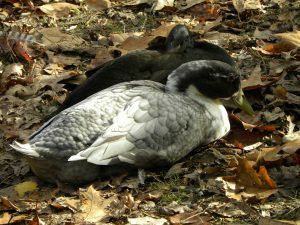 Runner ducks are considered “poor to fair” in their brooding and mothering abilities, so we’d never counted on this behavior from them. We got our first ducks in the summer of 2012 in order to help me with a terrible slug problem in the garden. Any eggs or meat were a nice bonus, but just eating the slugs makes them welcome here! This grey Runner is from that original batch, so she is now 4 years old. She never showed any interest before, but about 6 weeks ago she started hanging out in the nest box and HISSING at us when we looked in on her. After a few days of this, I decided she really meant it, and started collecting eggs for her. I gave her 9 eggs, but definitely did not count these chicks before hatching as I remained skeptical. To my amazement, on May 22 there were ducklings! It took until May 27 to finish up, but there are now 6 ducklings in there with her! The last one almost didn’t make it – she’d already gotten up from the nest to chase around her babes and get on with things so we took the last 3 eggs out of the nest. Steve left them by the compost for me. I always open up unhatched eggs to determine what went wrong – infertile or early death or almost made it. The first two eggs I whacked with a shovel to get through the super-hard duck egg shells – unfertilized. 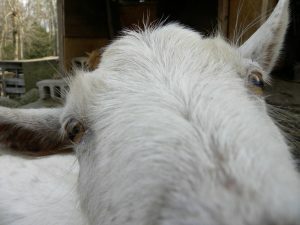 The third I whacked and the thing went crazy peeping back at me! I was quite horrified, but that shell had been too hard for it to peck out of and I was only trying to crack it so didn’t impale the little thing. I peeled it back a little to be sure it had a breathing hole and returned it to the nest where it finished up the work and got out and joined the little family. I was pretty terrified that it would be maimed or limping and I would have been the cause, but it really seems fine, just smaller than the older ones who had a few days of eating already! Ducklings grow crazy fast – a 5 day difference in age is absolutely noticeable. Final numbers and gender are still not finalized, but we know it will be our most successful hatching year yet, thanks to all these fabulous mamas!